So we must click the chest twice to open the inventory? you can barely see it, but its there. notch does appear to be holding sand in his LEFT hand instead of his right. diamond sword dual wield time! the clouds are orange durning sun set/rise due to the new lighting. It does look like a chest, but there is something different about it. The lid doesn't look right. Yet I don't see how a second chest is the "second" thing that is new. Unless they are adding more than one new chest like object. Did anyone notice that the chest lock is 3D now? that looks like it is placed in the background. This is a cut-out from the picture obviously. I mean the thing between the cacti. I think it's a chest, the colors just looks too much like it. it is definately not the thing we are used to. There hasn't been a opened chest before. This means that the 3D chest lock will have been there forever and not be something new to the opened chest. A) The sand in the left hand is two blocks, count pixels, and it can't be pressure plate because it's too big. Also, u can't see his tool bar, so the object wouldn't be showing, unless he changed that, which would be three things not two. 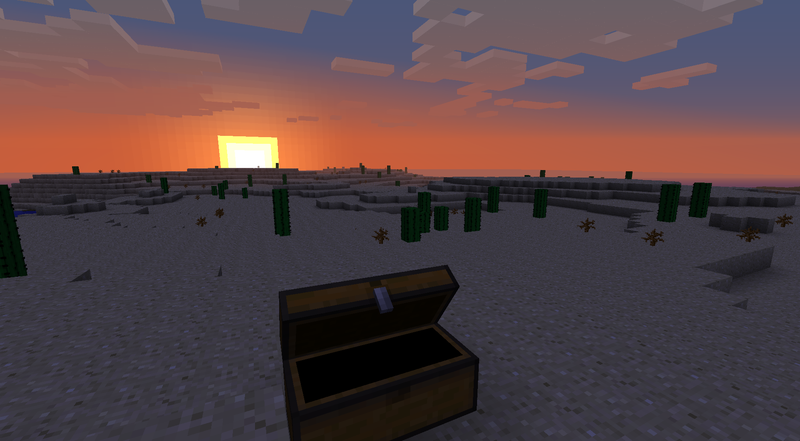 The "thing" behind one of the cactus is a chest. The texture matches, and the reason the top and bottom don't line up is because of pixels. If u don't understand, look at a sand block nearby. They don't line up either, yet their not "new blocks"
D) The horizon gives off orange light, making the clouds orange too, and there is no way to disprove it. And it isn't related to the chest. So, as u can see, the second change is the orange light of horizon. Wow the secound looks like something out of Terria! The second thing is definitely the sand block in his left hand. It isn't fancy angles and block placement because it looks as if the block is on a slant, as if being in Steve's hand. (You can see a gap between the top right corner of the block and the chest.) And, he isn't using F1 in this, he simply cropped it not to show the hotbar, health, hunger, etc. He cropped the picture to put the doubt that he had F1 on in our heads. oh my gosh1 thers a little desert mob behind one cactus! its sortof small and spying on you! I'm still don't understand how this is going to work. So if someones at a chest does it open up and it appears that way to other players? Or if you can just manually open it and leave it open then what? Does it make all of the items in the chest come out on to the floor? Or can you press Q and throw stuff in there? First, the "held" sand block is lined up to another block, and u can't hold two blocks. Don't say it's another change, because there is only ONE other. Second, I have tested the gap of which u speak, and it's possible, freakin' try it if don't believe me. It's a chest, read what people right sir, and don't repeat, u are the I don't know how manyith person to say that. Look the sky is blue! Ya ur right, it is blue. Did any of u guys realize the sky is Blue? Hey, the sky is blue. U get the point, hopefully. Don't repeat what people say, bring something new to the table. If what ur going to say someone has already said, DON'T SAY IT!